I have been coaching since 2015 and am working on multiple triathlon certification (USAT and eNRG Performance Institute). I have worked with both seasoned and beginners triathletes and runners looking to improve in both short course and long course distances. 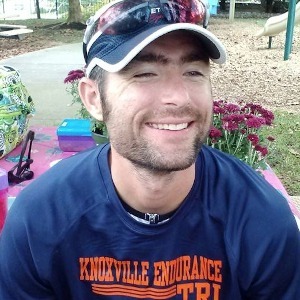 Knoxville Endurance offers multiple group coached training sessions per week. My training program offers both online and in person coaching. Coming primarily from a team sports background (basketball, baseball, and football), I decided in 2008 to run his first 5k. During this run I realized that there was more than long, lonely hours on the road, but also a chance to compete and be a part of a unique community. After completing his first half marathon, I signed up for a beginner triathlete program. In my first year racing triathlons I moved quickly from racing sprint and olympic distances to his first half-iron distance. Since then, I has finished 2 Ironman distance races (Florida in 2012 and Chattanooga in 2014) and is fully involved in the multisport lifestyle. Since beginning training with Knoxville Endurance in 2013, I set a marathon PR of 3:50 beating my previous best by over 20 minutes and also improving my Ironman PR by almost 50 minutes by completing Ironman Chattanooga in 11:38. As I begin to coach for KE, I will continue to work as a KE athlete in hopes of qualifying for the Ironman World Championships in Kona, Hawaii. Success. Coach Aaron Myers has been notified of your message.